The London Wall was originally built by the Romans in the late 2nd century in order to defend the city of Londinium against attackers. It fell into disrepair during the Saxon period but was rebuilt and refortified during the middle ages. The gates were later maintained for the purpose of levying taxes on goods coming into the city and the wall was only fully demolished in the 18th century. Many parts of the wall were incorporated into new buildings over the years. The wall ran a C-shaped course around the city starting in the west at Blackfriars and ending at the Tower. The most substantial wall remnant is at Tower hill, next to the Tower of London. There stands a replica of a Roman statue, thought to represent Emperor Trajan. You will also find here a replica of a tombstone that was found embedded in the wall, dedicated to Julius Classicianus, a Roman Provincial procurator. This impressive section of the wall still stands to a height of 10,6m. the Roman work survives to the level of the sentry walk, 4,4m high, with medieval stonework above. The wall was constructed with coursed blocks of ragstone with sandwiched rubble and mortar core. Layers of flat red tiles were used at intervals to give extra strength and stability. Complete with its battlements the Roman Wall would have been about 6,3 meters high. Outside the wall was a defensive ditch. To the north is one of the towers added to the outside of the wall in the 4th century. In the mediavel period the defences were repaired and heightened. The stonework was more irregular with a sentry walk only 0,9m wide. To the west was the site of the Tower Hill scaffold where many famous prisoners were publicly beheaded, the last in 1747. The pub The Black Friar, on the corner of Queen Victoria Street and New Bridge Street, was redesigned to its present look around 1905 by H. Fuller Clark in a combination of Art Nouveau and Arts & Crafts. The name Newgate is mainly associated with a prison. The first was built in 1188, subsequently enlarged, and then rebuilt after the fire of 1666. Work on a new prison was started in 1770 to a design by George Dance the Younger. Construction was disrupted by riots in 1780 but the building was completed two years later. It was demolished in 1904 to make space for the Central Criminal Courts, known as Old Bailey. The Old Bailey was designed by Edward William Mountford and completed in 1907. The Lady Justice on top of the dome was executed by the sculptor Frederick William Pomeroy. Across the street: 16 Old Bailey (Britannia House) was built as offices for the London, Chatham and Dover Railway in 1912 to designs by Arthur Usher. 15 Old Bailey was built in 1874 as the Imperial Hotel by architect Evans Cronk. St. Sepulchre without Newgate was originally a Saxon church dedicated to St. Edmund. The church became known as St. Edmund and the Holy Sepulchre during the years 1103 to 1173, when it was in the care of Augustinian canons, who were knights of the Holy Sepulchre. Later, the name became abbreviated to “St Sepulchre”. Rebuilt and much enlarged in 1450, the wall, tower and porch has survived from that period. Badly damaged in the Great Fire of 1666, the interior was restored in 1670 and has been much altered since. There is no way to trace the wall exactly here, so we we wander down Newgate Street and turn at St, Martins Le-Grand towards Aldersgate. Just off Newgate street we find the Cutlers Hall, originally built as the Royal College of Physicians in 1888 by architect T. Tayler Smith. The terracotta frieze was executed by sculptor Benjamin Creswick. At the corner of St Martin's Le-Grand and Gresham Street: the modern building in the back (25 Gresham Street) was built in 2002 by Nicholas Grimshaw and partners. Some more wall remnants and a guy sleeping. 88 Wood Street (left) was designed by Rogers Stirk Harbour + Partners and was built in 1993-2001. The Barbican estate was built in the 1960s and 1970s by architects Chamberlin, Powell and Bon. The word Barbican is derived from the Latin Barbecana, meaning fortified outpost or gateway. Within the estate we also find this church, St. Giles without Cripplegate. A church has stood on this site since Saxon times. The present church, which dates from 1090 was extended in 1340, and restored after fires in 1545 and 1897, and again after bombing in 1940. St Giles, by a strange coincidence, is a saint for cripples, although Cripplegate supposedly has no reference to cripples. Moorgate was added to the list of gates in medieval times. It has no church but there is a square with three Georgian terraces from the early 19th-century. The stuccoed fronts are from the 1870s. Moorhouse was designed by Norman Foster and was completed in 2004. The construction of the new Broadgate tower can be seen towards the north. The tower was designed by Skidmore, Owings and Merrill. St Botolph without Bishopsgate is the church at the next gate. The church survived the fire of 1666 but fell into disrepair. The present church was first consecrated in 1728 according to a design by George Dance the elder. It suffered severe structural damage after the IRA terrorist bombings in 1992 and 1993. 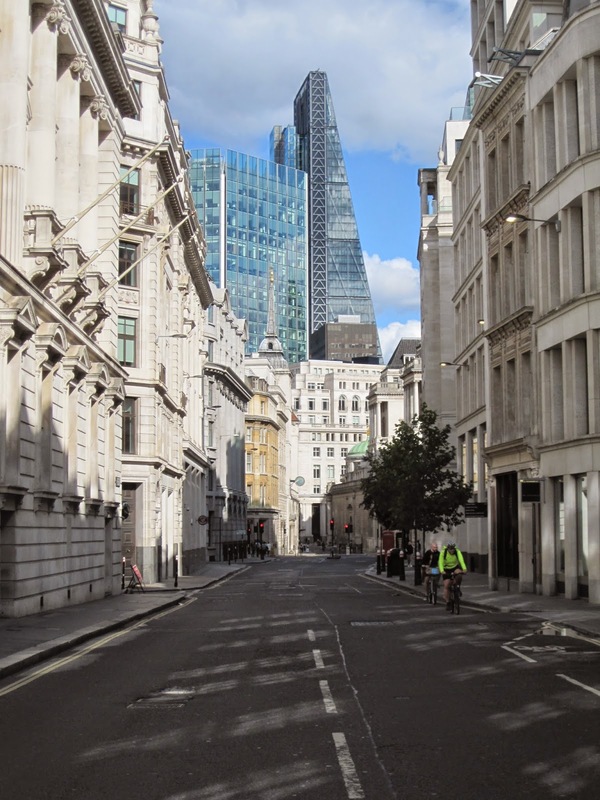 The highrise in the background is 99 Bishopsgate, reclad as result of bomb damage. It was originally built in 1976. Last gate on our tour is Aldgate. The church here is also dedicated to St. Botolph, and is called St Botolph without Aldgate. It also survived the Great Fire but fell into disrepair and had to be rebuilt, which was done to designs by George Dance the elder. The scale and style of the City has changed so much over time that the few Georgian remnants stand out. 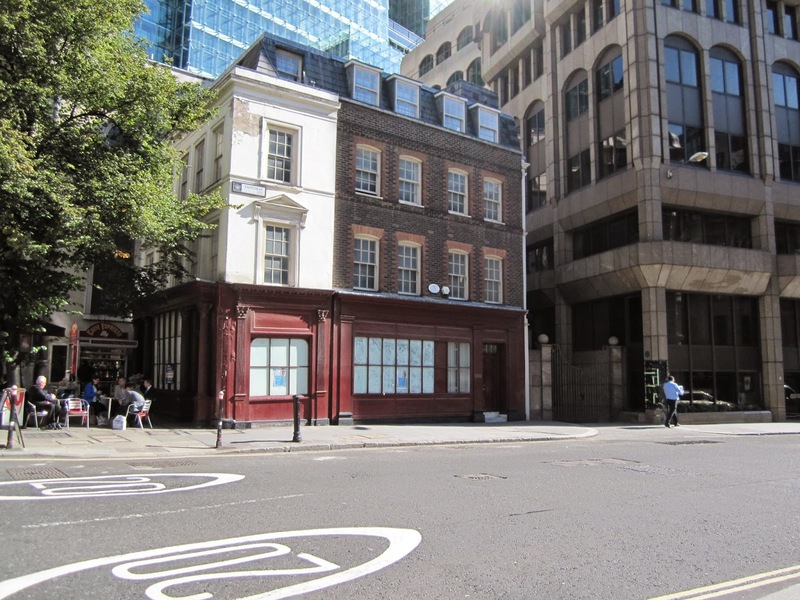 43 Eastcheap is a Grade II listed 18th-century house with an early 19th-century shop front, but the red-brick neighbour is a replica from 1966. Gresham street was created in 1881-95 by widening and joining Cateaton street, Maiden lane, St. Anne's lane and Lad lane. The building on the left is Gresham College, completed in 1912 to a design by architects Watney and Perks.